All of these features should be available to you by default. Let's just say, the owner of Techpro Solutions had a less-than-favourable experience with a non-accomplished website designer, who couldn't seem to get the job done - let alone pay special attention to the things search engines require. Search-engine friendly code is becoming more important every day that passes by. 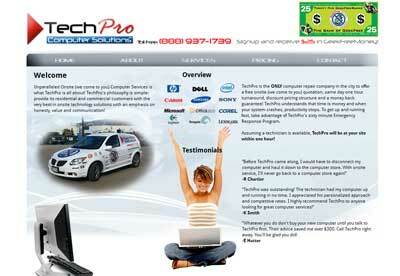 Scott eSolutions Ltd. implemented proven search-engine strategies to help people find Techpro Solutions. Four weeks since the launch of the new website and traffic has increased every day! These features represent a small subset of what Scott eSolutions Ltd. can provide for your business. Techpro now has the web foundation poured, and can begin adding interactive and dynamic features as desired; a news section, a forum, a blog, or even e-commerce capability.